The newest package in the NOVA.16 family! 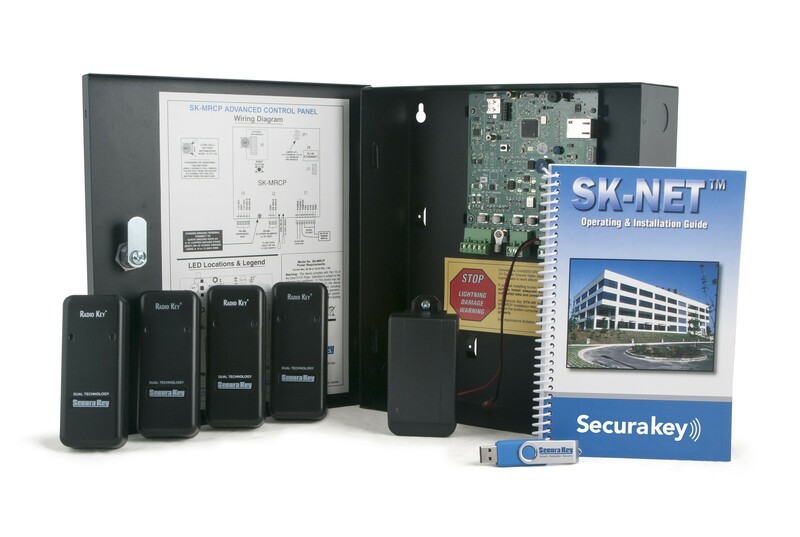 This proximity reader kit includes the NOVA.16 w/ enclosure, SK-NET software, SK-24VDC power supply, and four RKDT-SR-M mullion proximity readers. We are excited to announce the new NOVA.16 by Secura Key! This multi-reader access control panel system eliminates cable home runs from individual doors. The NOVA.16 introduces a new more efficient architecture for the SK-NET™ system. Each panel connects to the local area network using its built-in Ethernet connection, and it also connects to a high speed, RS485 peripheral network which supports up to 16 Smart Readers, each controlling a single door or gate. (NOVA.16’s can also be interconnected using the RS-485 Command Bus). The Peripheral Network can extend up to 4000 feet away from the controller. The NOVA.16’s RS-485 communications lines are protected with gas discharge tube surge suppressors, which helps keep systems running in areas with extreme weather conditions and power problems. 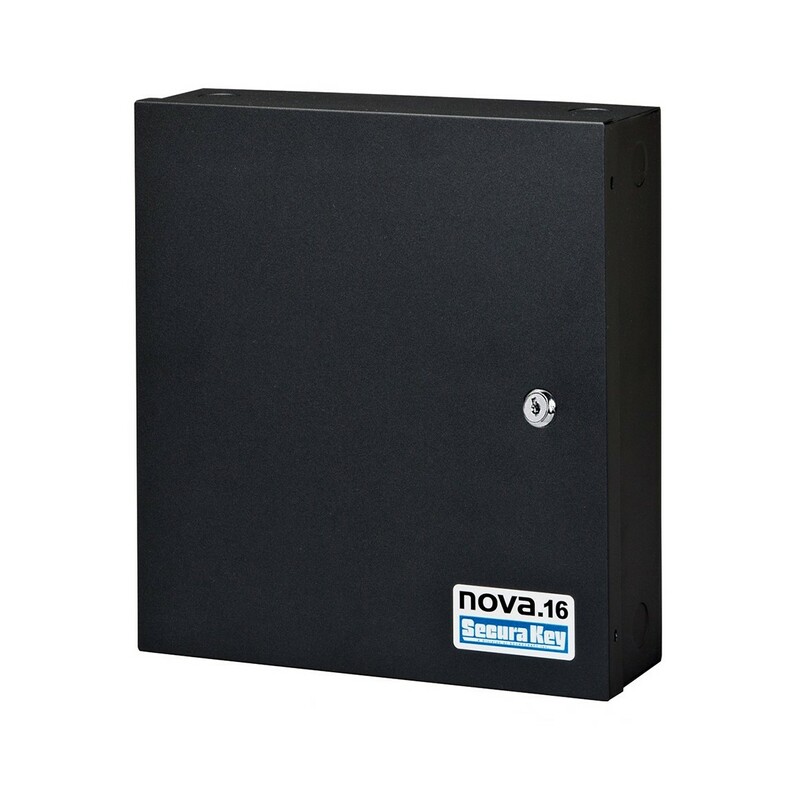 By reducing the number of control panels required for multidoor systems, plus the associated cost of providing electrical outlets, space and power supplies for those panels, the NOVA.16 provides a huge savings in installation time and cost. The NOVA.16 boasts a 3-Amp heavy-duty power supply with power line noise filtering and resettable thermal fuses. It continually monitors backup battery status. Communications speeds and transaction storage capacity have more than doubled over previous controller models. 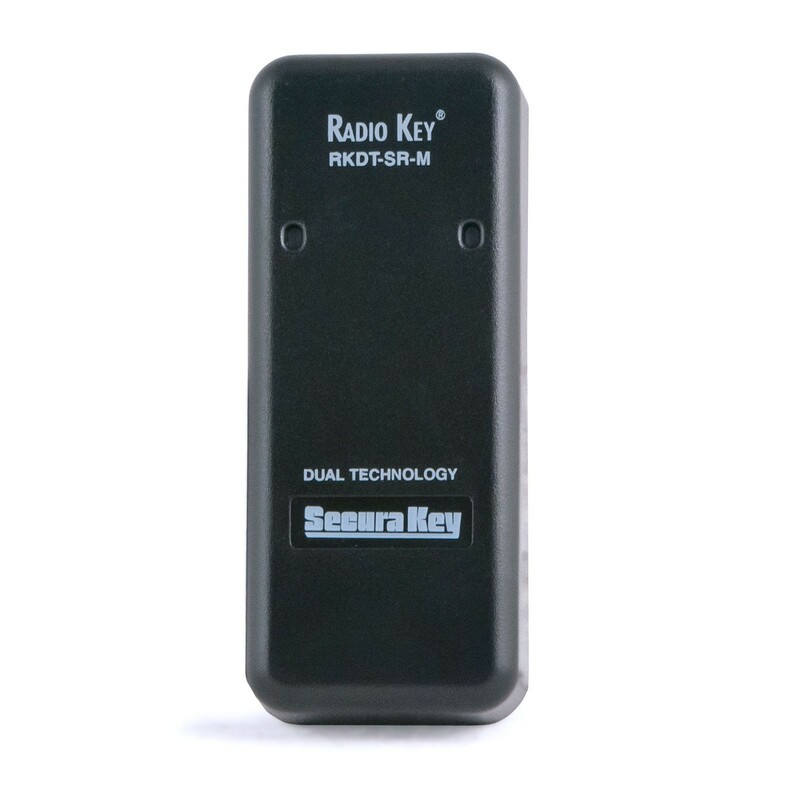 Secura Key Smart Readers are designed to work with the NOVA.16 Multi-Reader Control Panel, and SK-NET™ version 5.1. Each Smart Reader has all the inputs and outputs to monitor and control a door or gate, including a Solid State Strike/Latch Relay, two Open Collector outputs for controlling low powered devices (or interposing relays), and four inputs for monitoring door monitor switches, REX buttons, tamper outputs and more. These input and output connections are made directly at the Smart Reader. The Smart Reader only requires a twisted pair for RS485 data, plus an additional pair for 12VDC power, which can be accomplished using inexpensive CAT 5e cable. The Smart Reader eliminates the requirement for multiple cable home runs for door strikes, Wiegand data, inputs and outputs. It eliminates the cost of adding a control panel for every pair of doors – up to 16 Smart Readers can be connected to a single NOVA.16 control panel. The NOVA.16 can be added to an existing SK-NET™ system, and is functionally compatible with legacy SK-ACP controllers. An upgrade to SK-NET™ Version 5.1 is required. SK-NET™ Access Control Software is an easy-to-use Windows®-based program for managing NOVA.16 control panels. The SK-NET-DM basic software controls up to 200 doors using RS-485, and it also allows a single TCP/ IP connection. SK-NET™-MLD Multi-Location Software is required for dial-up modem use or multiple TCP/IP connections, and allows an unlimited number of locations or NOVA.16 panels to be connected via TCP/IP. SK-NET-MLD features fully integrated ID badging software. SK-NET-MLD is single-user multi-location software, but if you require multi-user, multi-location capability, you can purchase SK-NET-MLD Client Server Version (SK-NET-MLD-CSx), available with licenses for 2, 5, 10 or 15 simultaneous users. SK-NET™ is very intuitive and easy to learn, with Windows® conventions such as drag-and-drop and right-click menus. Transaction history displays all card uses with time, date, location and user names. SK-NET™ also features video integration with Remote Eyes® Video Management from Odyssey Technologies. Stored video is are associated with card transactions, alarm conditions or other events. Please Note: While the NOVA.16 access system can control up to 16 doors, this kit includes enough readers to control 4 doors. For access to more doors, we recommend using Securakey Smart Readers. 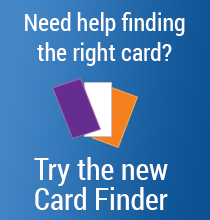 If using a card reader other than a Smart Reader, you will need to have one Single-Door Interface Wiegand Interface Unit (SK-WIO-1) per reader in order to use it with the NOVA.16.